Butkovich, Brad. 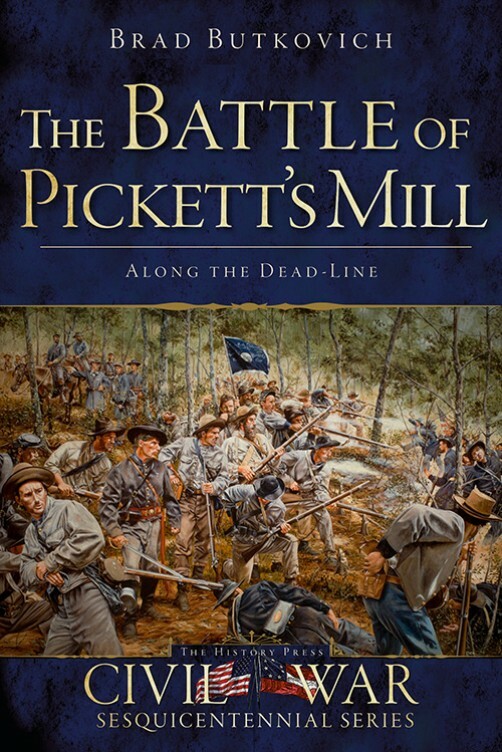 The Battle of Pickett’s Mill: Along the Dead-Line (The History Press, 2013). 208 pages, over 20 images, maps, order of battle, notes, bibliography. ISBN: 978-1-62619-042-9 $21.99 (Paperback). The Battle of Pickett’s Mill: Along the Dead-Line is the first detailed modern book focused solely on the Battle of Pickett’s Mill. The small battle is most famous for the “criminal blunder” made by someone in the Union high command. Through detailed maps, clear writing, and a thorough grasp of the details, Brad Butkovich has produce what is likely to be the best book written on Pickett’s Mill for quite some time to come. This History Press “Sesquicentennial Series” book is a must own for anyone interested in the Atlanta Campaign. Brad Butkovich is an experienced wargamer, wargame publisher, and historian. He also has a BA in History from Georgia Southern University. I reviewed his wargaming book on regimental level Chickamuaga scenarios a few years ago, and this book continues his good work. Butkovich’s wargaming influences work to his advantage in this detailed micro-history of Pickett’s Mill. My earlier review of Russell Blount’s The Battles of New Hope Church covered the reasons why Sherman was out in the wilderness of the “hell Hole” region in the first place. It suffices to say here that Sherman had hoped to bypass the strong defensive position at Allatoona, and Johnston’s Confederate army met him in the area of New Hope Church and Dallas, resulting in three small battles. One of those battles, Pickett’s Mill, occurred on May 27, 1864, along the far northern end of the opposing lines. Oliver Otis Howard of Chancellorsville infamy had been given a second chance in the west, leading the Fourth Corps of the Army of the Cumberland in an effort to find and move around the Confederate right flank. Opposing his men in the rough and wooded terrain was the crack Confederate division of Patrick Cleburne, arguably the best fighting force the Confederates possessed outside of the Army of Northern Virginia. As Howard spent most of May 27 slowly trying to work around the Confederate flank, Cleburne opposed him, digging new trenches and clearing small paths through the rough terrain just behind his line of battle. Late in the day, the Union forces launched a disjointed attack which resulted in heavy losses for Wood’s Division of the Fourth Corps. Gibson’s First Brigade was especially hard hit and left to suffer by the Union high command. The result was considered a “criminal blunder” by Ambrose Bierce, a member of the staff of William B. Hazen’s 2nd Brigade. Many others involved from Wood’s Division must have felt the same way. Darkness did not even end the fighting, as Cleburne launched a night assault to clear the woods in his front of the vulnerable and exhausted Union soldiers still hanging on. Several days later, Johnston had retreated in the direction of Marietta and the Atlanta Campaign wore on towards Kennesaw Mountain. The Battle of Pickett’s Mill: Along the Dead-Line is the first detailed look at this small “criminal blunder” made most famous by eccentric author and Pickett’s Mill veteran Ambrose Bierce. Butkovich covers the action in great detail for the entire day on May 27, not just the late afternoon and evening fighting. In addition, his maps are excellent and show a wargamer’s attention to detail. I’ll have more on that in a bit. This History Press entry works very well in the format the publisher has perfected for its “Sesquicentennial Series”. Butkovich writes well, describing the action in an easy to follow manner and tying the text to his maps. Each phase is covered by an entire chapter, with most phases being at the brigade or lesser level. Butkovich moves through these mostly chronological phases in a way that allows readers tounderstand what must have been an incredibly confused and confusing battle for its participants, even more so than a standard Civil War battle. His ending chapters focus on the bloody aftermath and the park as it exists today. Throughout the book, the author relies on first person accounts to help tell the tale. The Official Records form the backbone of his references, as they should. I wanted to take some extra time to cover the maps and order of battle in this book. They are excellently done. Maps go down to regimental and even company level in the battle sequences, with higher level organizations being the primary representation on the earlier maps leading up to the actual fighting. Although the maps are in black and white, woods, fields, and elevation, all key players in this fight, are well represented. Elevation lines make it relatively easy to see how a ravine near the left center of Cleburne’s line played a key role in the fighting. Butkovich also makes sure to provide photographs of some of the key terrain features so readers realize just how difficult the terrain was in this area of North Georgia. The orders of battle contain strengths down to the regimental level wherever known. Butkovich expended considerable effort to get this information, but even he couldn’t find specific strengths down to the regimental level for all units. Considering the daily nature of the fighting in 1864, this is not surprising. I wish more authors went to this level of effort to find numbers at this level of detail. Not many do, and I try to commend authors who go that extra mile. The books focused on individual battles of the Atlanta Campaign continues to grow. The Battle of Pickett’s Mill: Along the Dead-Line by Brad Butkovich, and entry in The History Press’ “Sesquicentennial Series” of books is one of the best in that series and one of the best battle studies on an individual battle of the Atlanta Campaign. Readers interested in the local history, the Atlanta Campaign, or wargaming the battle will want to own this book. Fans of good battle/campaign studies will recognize another excellent effort here. Author Butkovich has made the jump from wargaming books to a battle study with ease, and I hope to see more from him down the road, perhaps in this same series. This book is highly recommended.